Tropical forests are some of the richest, most exciting areas on earth. They are home to gigantic trees, colourful birds and a huge variety of fascinating mammals. About 80% of the world's documented species can be found in tropical rainforests, even though they cover only about 6% of the Earth's land surface - less than half the area they covered not so very long ago. Tropical forests are closed canopy forests growing within 28 degrees north or south of the equator. They are very wet places, receiving more than 200 cm rainfall per year, either seasonally or throughout the year. Temperatures are uniformly high - between 20°C and 35°C. Such forests are found in Asia, Australia, Africa, South America, Central America, Mexico and on many of the Pacific Islands. Rainforest trees are quite different from trees of temperate forests. In the rainforest, trees grow to gigantic size, supported by strong, strut-like buttresses at the base of the trunk that help to stabilize them in shallow forest soils. Huge creepers twine themselves around the trunks of trees. A mature lowland tropical forest consists of several layers. The top layer of vegetation consists of scattered tall trees which tower above a closed canopy layer formed by the crowns of other trees. The canopy is the most exciting part of the rainforest; it is here that most of the flowering and fruiting of the trees takes place, attracting a variety of spectacular creatures. Below the canopy is a third layer, formed by smaller trees whose crowns do not meet. Below that is a layer that's composed of woody and herbaceous shrubs. Finally, there is the ground layer, which receives very little sunlight. Tropical forests have the largest living biomass and boast some of the highest rates of terrestrial biodiversity. But rainforests are perhaps the most endangered habitat on earth and most vulnerable to deforestation. Each year, some 140,000 sq km of rainforests are destroyed. Rainforests are being felled for timber by logging companies and cleared by people for farming. The most endangered rainforests are those in West Africa, where human populations are doubling every 20 years, and in Central America and South-East Asia. Although large areas of rainforest remain in Central Africa and South America, they, too, are disappearing at an alarming rate. 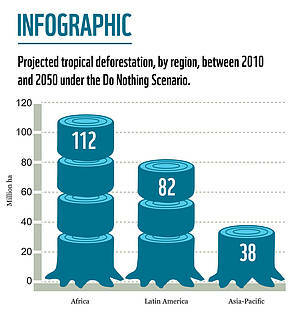 Forest degradation and deforestation in tropical countries is a major environmental, social and economic problem, and will continue to be so unless action is taken. Time is short if we are to save the remaining rainforests for future generations and preserve the beautiful biodiversity that these rainforests harbour. Living Forests Report: Chapter 1 "Forests for a living planet"
Tropical rainforests have more kinds of trees than any other forests in the world. The richest in plant species are Amazon forests, but in general all tropical forests have an incredible variety of trees. WWF is committed to conserving the world's rainforests, not only because of the incredible wealth of plants and animals, but for the benefit of the indigenous peoples who call these forests their home. 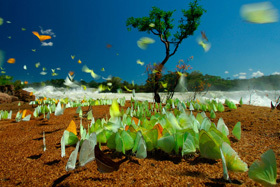 WWF has been working to save rainforests for more than 35 years. Today, work continues in key areas like Peru's Manu Biosphere Reserve and the Korup National Park in Cameroon. Assisting tropical countries to save their rainforests - through creating protected areas, exploring ways to use forests wisely and promoting purchasing of responsible forest products - is a priority for WWF.